Martin Carver, Justin Garner-Lehire, Cecily Spall. 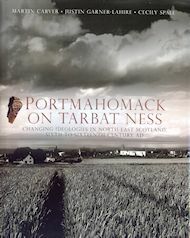 Portmahomack on Tarbat Ness: changing ideologies in north-east Scotland, sixth to sixteenth century AD. Portmahomack on the Tarbat peninsula overlooking the Dornoch Firth is a fishing village with a 1,500-year-old history. In the sixth and seventh centuary it was a high-ranking centre with monumental cist burials and links to the equestrian class in England. In the eighth century it was a monastery, creating manuscripts and making church vessels and a stunning repertoire of carved stone monuments, its monks looking to Ireland, western Scotland and Northern England for their intellectual alliances. Around 800 AD the monastery came to an end following a Viking raid, but swiftly revived as a manufacturing and trading centre, now serving the protagonists of the Norse-Scottish wars. Rediscovered by archaeologists in the 1980s, from 1994 to 2007 the site at Portmahomack saw one of the largest research excavations to have taken place in Scotland. Opened by Charles, Prince of Wales, the museum in the church of St Colman’s displays these discoveries and is visited bv people from all over the world.